This workhorse vending machine is designed especially for the professional vending route operator. Increase your profit without breaking your budget by adding these machines to your bulk vending arsenal. We also utilize these in our stand and rack units available in our store. If you're looking to replace your vending machine heads, this machine would be a very good option. 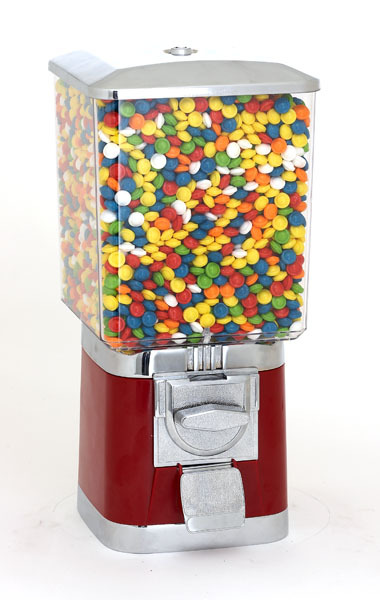 At the office, we were looking for a machine for specialty jellybeans. This machine arrived and has been perfect! For $0.25 ... you get just the right amount 12-14 beans or so... I chose black base, and it has been a great hit so far! so far very happy with the product. its easy to maintain and works great never jams when loading quarters or misfeeds by ripping off the customer by not giving a gumball. love my machine its the best.. Lock is cheap and you are very lucky to get one that works. I bought two and only one works... UPDATE FROM CANDYMACHINES.COM: The locks have been updated and carry a full warranty. Got this for our counter and put mints in it. Very easy to clean and very sturdy.